The book of Isaiah was written by the prophet Isaiah in order to call the nation of Judah back to God. Judah had turned to Egypt and other nations for their strength. Their eyes had turned to idols and they were no longer looking to the one true God that could save them. God reminded the people, through the prophet Isaiah, that He alone could save them and would provide them strength. But, they were unwilling! As I read this verse, the words “but they were unwilling” really stood out to me. I wondered how often I have been unwilling to look to God alone when I have felt overwhelmed and tired from day to day life, yet alone in the times of intense trials and battles. How many times have I poured out my troubles to a friend before I poured out my heart to God? How about the times I turned first to things like shopping, television, Facebook, food, or anything else that I thought, at that moment, would bring me satisfaction or distraction. As I read this verse, I made a note of these five truths in the margin of my Bible as a reminder to me that I must be willing to choose these first. 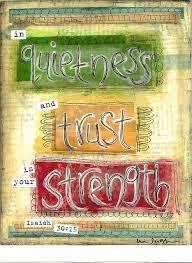 In so doing, God will will bring me quietness and strength for every situation that I face. 1. Returning – We are to turn from wrong and turn to God. Outright disobedience in our lives is never consistent with real trust in God’s promises. Returning also has the idea of drawing close to the Lord. 2. Rest – Cease striving for ourselves! Be still! (yep, there’s my 2014 word again!) When we are trusting God we don’t have to run all about trying to protect or guard ourselves. We have the best Protector. When we rest is shows that we are really trusting God. 3. Quietness – Choose quiet submission to the will and ways of God. Don’t argue before Him or others. 4. Trust – Have complete and humble confidence in God. Don’t give in to despair or fear, because you have confidence in God’s complete control. 5. Willingness – Desire to be obedient to God. If you look at the next verse (Isaiah 30:16), you will read that Judah made the decision to not obey these truths. Instead, they chose to “flee on horses”. They ignored and disobeyed God. If they would have trusted God’s promises they would have had no reason to flee and would have seen the Lord’s salvation and strength. Consider what you lose out on when you are “unwilling” to obey these truths. Have a Grace Full week of being willing to obey God! Thank you for drawing our attention to this Truth today! So thankful that God is using this to speak to your heart! You must be reading my mind and heart. I’m in a big time mode of trying to “trust” and “rest” right now. It’s amazing how this brings intimacy with the Savior, but it’s a constant re-surrender! Thank you for the tools to keep on! Continuing to pray. I know how much these words challenge you right now. So thankful to be able to encourage you with God’s Word!